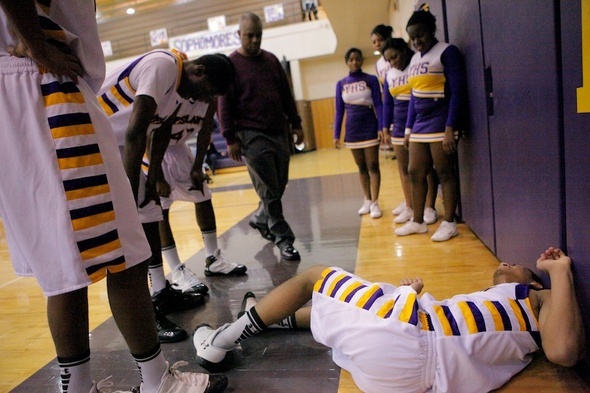 Posted on Sun, Feb 19, 2012 : 5:30 a.m.
Ypsilanti guard Derrick Richardson lies on the ground after rolling his ankle against Dexter on Friday. When Ypsilanti High School point guard Derrick Richardson hobbled off the court during FridayÂ’s game against Dexter, coach Steve Brooks thought he had re-aggravated a previous ankle injury. Turns out it was a brand new bump for Richardson, who is fresh off of recovering from a back injury from a couple of weeks ago, as well. Richardson would only miss a couple minutes. When he returned, he would lead his team in scoring with 14 points in a 54-25 win over Dexter. Having overcome a couple nagging injuries already this season, Brooks is not worried about Richardson'Â’s physical style. Â“"He is our hardest worker and usually when a kid works hard, they donÂ’t stay injured long, because theyÂ’re used to the bumps and bruises they get every day,"Â” said Brooks. Brooks is more worried about next year, when he'Â’ll have to replace the senior. Friday night wasn'Â’t just senior night in name at Huron High School on Friday. Seniors accounted for 61 of the River RatsÂ’ 67 points in a 67-51 win over Saline. Huron coach Waleed Samaha started five of the teamÂ’s eight seniors and the first players off the bench were seniors, as well. It took nearly six minutes before an underclassman entered the game. After the game, Samaha extolled the virtues of the class. Â“"WeÂ’re going to miss the seniors,Â” Samaha said. Â“WeÂ’ve got eight fantastic seniors and each of them brings a personality to the team. Not just as players, but as people.Â”"
The Manchester girls basketball team struggled from the free-throw line on Thursday night against Michigan Center, shooting just 14-of-26 (53.6 percent) from the line. The Cardinals tried to take advantage of the Flying DutchÂ’'s struggles, but went a little overboard. Four Michigan Center players fouled out -- including their two top scorers -- and it had to finish with just four on the floor. Manchester (17-2) went on to avenge one of its two losses on the season with a 40-30 win. The win puts the Dutch in a position to play for a share of its first ever Cascades Conference title. Manchester, 11-2 in league play, hosts first-place Grass Lake (12-1) on Thursday. The last unbeaten team in Washtenaw County Â– the Arbor Prep girls team Â– lost its first game of the season on Thursday. Bloomfield Hills Lahser made 12-of-15 free-throw attempts in the fourth quarter in a 57-51 comeback win. Karlee Morris, Zakiya Wells and Julanna Dukes all finished with 14 points for Arbor Prep (16-1). "You don't want to say you're happy that you lost," said coach Rod Wells. "But sometimes you need the experience of losing to show what you need to work on."